Dr. Yang is by far the best dentist I have ever had. She is a consummate professional and very sweet. Dr. Dongmei Yang is a general and cosmetic dentist in Worcester County and has been practicing dentistry for over 20 years. She is vastly experienced in all facets of general and cosmetic dentistry and is constantly learning new and advanced dental techniques and technologies. Dr. Yang is a member of American Dental Association, Mass Dental Society, and Worcester District Dental Society. 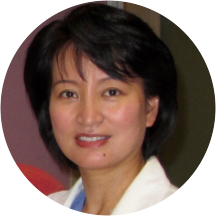 Dr. Yang received her DMD degree from Tufts University, School of Dental Medicine in 2001 and her DDS degree from West China University of Medical Sciences, School of Stomatoloy in 1987. "I believe in treating all of my patients with the same respect, kindness, and dignity that I would treat my family with. This helps me to establish trust and build a strong relationship with my patients which is crucial to me because it allows me to provide better care. Helping my patients achieve good oral health and happiness is a passion of mine." Dr. Yang and her husband, Dr. Xiaofei Wang, a pathologist at University of Massachusetts, have been living in Shrewsbury since 2001. Their son, Lingke, is an MBA student at Stanford Graduate School of Business. Determinants of Total Homocysteine Levels in a Population Undergoing Coronary Angiography. J. Investing. Med. 47:133A, 1999. Dr. Dongmei Yang was very professional. I am very happy with the office visit today. Dr Yang and her staff are the best at what they do and great people also. I've been seeing Dr. Yang for 3 years now and always have a great experience. Dr. Yang and all the staffs are super nice, careful and professional. Best Dentist I ever experienced. Very thorough, nice office environment. Highly recommend. Dr. Yang is the most gentle dentist. I am not the best patient when it comes to dentail anything, i mean cleaning and xrays are even a problem. My anxiety goes off the roof..first couple appts with her were not easybut she was very patient and assuring and kept asking if I was okay. Today, i got a root canal and it was the least stressed I've been. From the receptionist, Ms. Susan to the dental hygienist, Ms. Holly & Ms. Ashley, they are all very professional and very friendly and it starts with Dr. Yang. I'm glad I found her and will not be changing dentist again. Best dentist and team, period!! The Doctor was very through during her examination. My visit was a yearly check up, staff was very friendly. Dr Yang is professional. Dr. Yang and her team (Susan and Holly) provide excellent care and I am thrilled to have them taking care of my dental needs. Each time I've had a visit with Dr.Yang and staff, it's always been a pleasant and comfortable experience. Her services has exceeded my expectations and the results are amazing. I would recommend this office to any and everyone looking for reliable, quality dental care. Was very nice modern office!! Plenty of parking!! I was so nervous to see the dentist but both Dr. Yang and her assistant were wonderful. they made me feel comfortable. Finding a great dentist who will take Mass Health insurance was not easy. I discovered Dr. Yang through ZocDoc and found she had great reviews. I have had 3 appointments so far and every time has been great. Fast appointment scheduling,less than 5 minute wait time, knowledgeable and gentle dental work. I Highly recommend this Dr. for anyone looking for excellent service. My first visit was a consult. After discussion about my dental problems with Dr Yang, including explaining my xrays to me, I decided to stay with dr Yang for my next procedure and, I imagine, for all of my dental care going forward. Dr. Yang has such a warm personality and a wonderfully calming bedside manner. I am extremely pleased with the excellent care she provides me for every appointment. Holly, her hygienist and Susan, her receptionist are also very skilled andwelcoming. Dr. Yang and her team are very much appreciated by me and my family. Everything about this visit was great! The office is beautiful; the office staff are friendly and helpful. I experienced no pain in the filling of my cavities--Dr. Yang's whole demeanor is very friendly and professional, and she did a greatjob. This was by far the best dentist visit I've had in a long time. I highly recommend Dr. Yang! I get extremely anxious when I go to the dentist, but Dr. Yang made me feel very comfortable. She was very pleasant and professional and was very gentle throughout the entire visit. I booked another appointment with her for work tobe performed. I recommend Dr. Yang to anyone, especially if they have dental phobias. So thorough and knowledgeable. I Trust her judgment and she's so pleasant and gentle. Very nice doctor! I am an international student. Susan is very patient explaining the meanings of the professional words. Dr. Yang's ability of speaking Mandarin helps me to express my concerns completely. Also, she and her assistant are very gentle, I didn'tfeel pain at all. As a WPI student, I got a great discount from them. Dr. Yang is highly skilled and has a wonderful bedside manner. She immediately put me at ease and was extremely gentle in both her approach and her work. I am very pleased to have her as my dentist. Amazing, very polite, caring, gentle workers who enjoy there job. Such positive energy in the office, friendly atmosphere.. A must go!!!! Everyone was pleasant and made me feel comfortable. The office is also very pretty and has a warm feeling. Very professional and friendly. Explained what would be happening in my appointment and what to expect. Very nice....and very gentle cleaning my teeth. I had not been to a dentist in years, due to prior bad experiences. From the first visit with Dr. Yang I was put at ease by the professionalism displayed by everyone in the office. Both Dr. Yang and her assistanthad the best bedside manner, and all procedures done were very painless. The complete opposite of what I was expecting. I highly recommend making your next dental appointment with her. Dr. Yang has been my dentist for 10 or more years. I followed her when she opened her office in Worcester. I have no reservations about recommending her. The doctor didn't try to sell me a costlier treatment, which I was scared about, since I didn't have a dental insurance (I am an intl' student). She was legitimately concerned about my dental health, and asked me to avoid sodasand to floss. Very gentle lady, didn't lead me to panic at all. The procedure was very smooth. Very satisfied. Very good work. Very gentle and a real professional. Dr Yang and her staff are always so professional and also personable. I checked in a few days earlier with ZocDoc. I arrived (not a little early as usual, but due to the weather and road conditions) exactly on time andthey were ready to go. Where has anyone ever seen that? Beginning with the high quality of dental care, the excellent condition of the offices, the parking, the efficient and friendly staff -- everything about this practice is excellent, including the great music. It makes me want to be the best patient I can be. Dr. Yang is a very professional dentist. She is very nice and patient to explain my situation and would like to provide affordable solutions. I definitely recommend her to all who want to have a good dentist. Glad i went, happy to meet her & very relaxed during aappointment. Dr. Yang and staff are professional and friendly. Office is neat and nice. Very gentle ! Great assistants. Dr Yang is professional on her job. She offered me appropriate suggestions on my teeth treatment. I am absolutely satisfied with her great work.